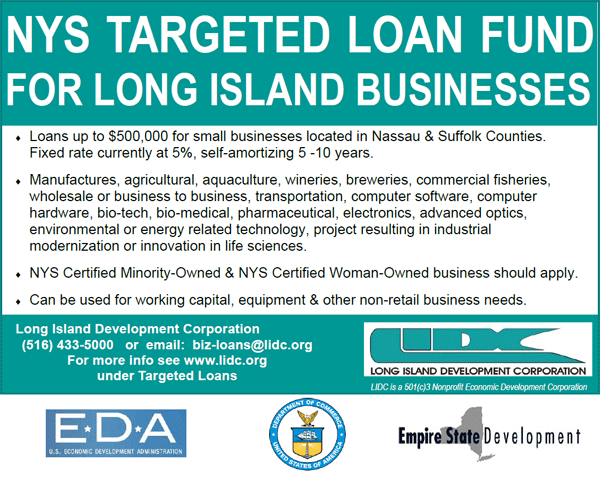 Loans up to $500,000 for small businesses located in Nassau & Suffolk Counties. Fixed rate currently at 5%, self-amortizing 5-10 years. Manufactures, agricultural, aquaculture, wineries, breweries, commercial fisheries, wholesale or business to business, transportation, computer software, computer hardware, bio tech, bio medical, pharmaceutical, electronics, advanced optics, environmental or energy related technology, project resulting in industrial modernization or innovation in life sciences. NYS Certified Minority-Owned & NYS Certified Woman-Owned business should apply. Can be used for working capital, equipment & other non-retail business needs.